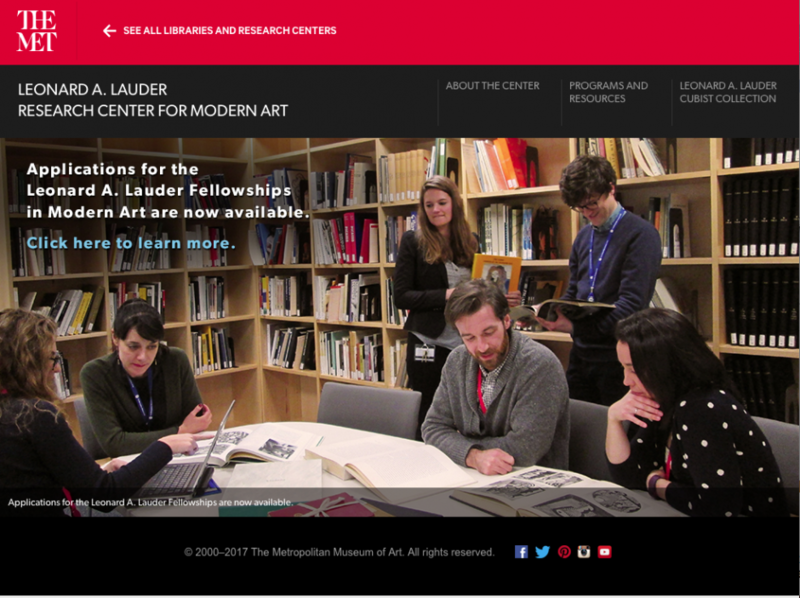 Founded in the spring of 2013, The Leonard A. Lauder Research Center for Modern Art is a leading center for scholarship on modern art with a focus on Cubism and aims, through its various programs, to make critical contributions to the study of twentieth-century art. Each year, The Metropolitan Museum of Art offers two fellowships in the Research Center to scholars studying Cubism or a related subject in modern art. One two-year position is intended for a predoctoral candidate who is embarking on his or her dissertation; the other fellowship is reserved for a qualified postdoctoral scholar at any stage of his or her career and may be one or two years in duration. All Leonard A. Lauder Fellows are expected to contribute to the activities and programming of the Leonard A. Lauder Research Center for Modern Art. All predoctoral fellowships must take place between September 1, 2018 and August 31, 2020. All postdoctoral fellowships must take place between September 1, 2018 and (depending on the length of the fellowship) August 31, 2019 or August 31, 2020. The stipend amount for one year is $45,000 for predoctoral fellows and $55,000 for postdoctoral fellows. During the fellowship period and at the Museum’s discretion, Leonard A. Lauder Fellows will be eligible to receive one or more travel stipends. Fellowships in the Research Center offer an exceptional opportunity for scholars of modern art to conduct focused research on an independent project. As part of a larger cohort of Met Fellows, the Leonard A. Lauder Fellows will participate in the weekly gatherings and workshops organized by the Museum’s Education Department, in addition to those organized by the Research Center.